Business Is Relationships. Build Your Referrals. Yet we don’t really focus on the current health and value of our relationships with business contacts. As small businesses we track and analyze piles of information, and ignore our greatest assets, relationships. Here’s a system (or part of a system) we have used for several years that can drive your sales, and build your relationships. I think its self explanatory. Just list every business contact you can think of… even people you haven’t communicated with for years, in each category. 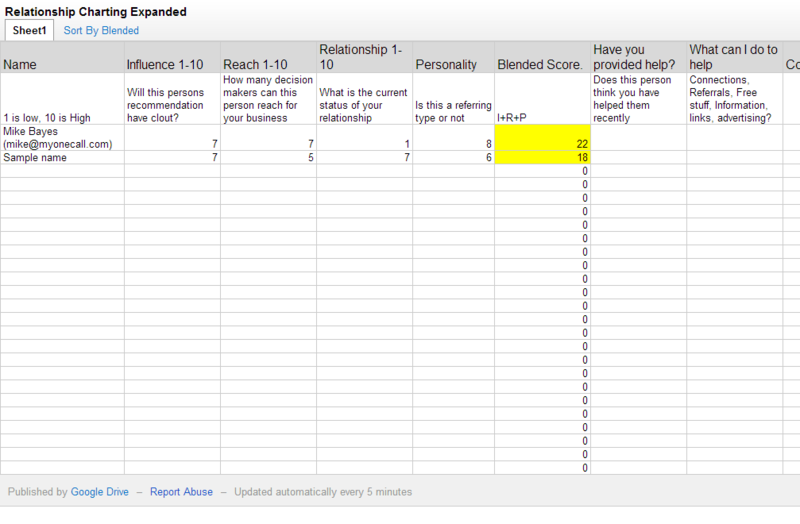 The spreadsheet gives you a blended score which in theory predicts which of your contacts has the most “referral” potential. Then do something for each one. Even if you can’t think of anything to offer, you can call or email them, and say, I was just thinking about you and wanted to see what you are doing these days. You can offer to do an introduction to someone, or invite then to lunch. Have a great tip on sales or marketing, or something that is working for you that you can share? Any thing that is of value. Relationships, like anything else, need maintenance and nurturing. This simple spreadsheet can go a long way in helping you grow your most important marketing and sales resource… the relationships you have built.I would love it if you would try this for a week or two to see what results come from it. I can tell you, it’s been my number one source of leads and sales for two years. If you are an Internet Marketer you can use it to build great on-line contacts. In many ways, its much faster because you can use Social Media as the nice thing to do for someone. Post their blog on your G+, Facebook, Linked in… that’s a gift. Even good blog comments are gifts. Let me know how this works! This is a part of our Sales Coaching Program. Need help building your sales and revenue? Contact me for a free consultation.